This week, all week long, we're taking a brutal look at each of the teams in the NFC East, in detail. The first target was the mired-in-mediocrity Dallas Cowboys. Today we'll tackle the 3-13 New York Giants, who were completely irrelevant before November began a season ago. To note, we will not be talking about the positives of any of the Eagles' NFC East rivals, because, well, that's no fun. This will be 100 percent vitriolic. And yes, we'll (try to) torch the Eagles at the end of the series as well, though again, I'm not sure exactly how just yet. C Weston Richburg left in free agency. OT/OG Justin Pugh left in free agency. They signed OT Nate Solder away from the Patriots on a four-year, $62 million deal that makes him the highest-paid offensive lineman in the NFL. They signed OG Patrick Omameh away from the Jacksonville Jaguars on a three-year deal worth $15 million. They drafted OG Will Hernandez with the 34th overall pick in the 2018 NFL Draft. First, let's get to the departures. Richburg and Pugh were unarguably the Giants' two best offensive linemen. The Giants felt comfortable letting Richburg walk on the premise that they believe in backup center Brett Jones. That was nonsense, as Jones is competing with Jon Halapio for a starting job. The Giants obviously felt like Richburg wasn't worth the five-year, $47.5 million contract he received to play for the 49ers. I don't disagree, as that is an asinine contract. Still, going from Richburg to Jones/Halapio is a downgrade. Meanwhile, Pugh was capable of playing four spots along the offensive line. While certainly not a world-beater by any stretch, Pugh is the kind of offensive lineman coaches love because his versatility allows the offense to weather the storm when injuries are suffered along the OL. He bolted for the Cardinals on a five-year deal worth $45 million. Again, that is big time money for an OK starter, but Pugh will be missed. First, the Giants added Solder, who as noted above, is now the highest-paid offensive lineman in the NFL. Unfortunately for the Giants, he is, at best, the fifth-best offensive tackle in the NFC East, and maybe even lower. Making Solder the highest-paid offensive lineman in the NFL was a ridiculous overpay. However, considering how awful their line was in 2017, particularly with Ereck Flowers at left tackle, the Giants clearly felt like adding a competent left tackle was worth the price of not having to worry about some RDE wrecking the game from week to week. Flowers will likely move from left tackle to right tackle, which is easier said then done, as many defenses now put their best pass rusher up against the RT. And finally, at RG is Omameh, a journeyman guard who is now on his fifth team in six years. Omameh was a fallback option after losing out to the Jacksonville Jaguars for Andrew Norwell. Like Solder, Omameh is being overpaid on a three-year deal worth $15 million. Whether or not you think the Giants improved their offensive line, one thing that is indisputable is that the OL has no continuity whatsoever. In fact, they are one of two teams returning just one OL starter. It's no coincidence that the five teams returning all five OL starters all made the playoffs in 2017, and that all but one of the teams returning three of fewer OL starters were watching the playoffs from their sofas. More simply stated, offensive line continuity is a big deal. 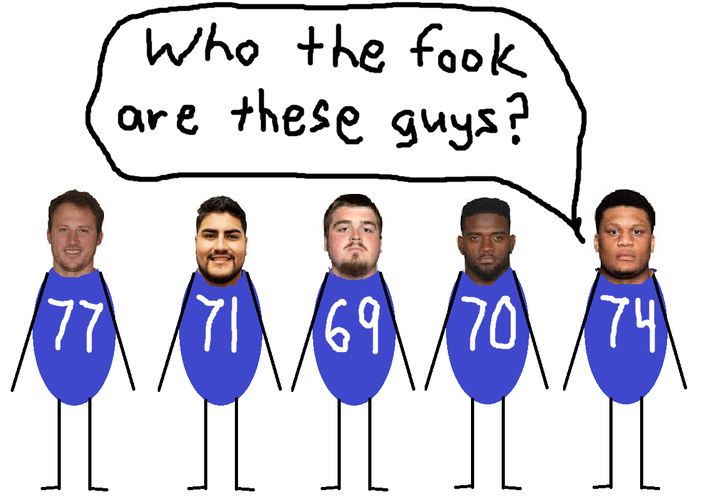 I went a long way to make the point that the entire projected starting Giants offensive line has never played a single regular season snap next to any of the other players on the line. Is that bad? After the selection of Saquon Barkley, when asked about positional value in the draft, Giants GM Dave Gettleman responded, "I think it's a crock. At the end of the day, a great player is a great player. (Former Giants GM) Ernie (Accorsi) and I have talked about it a lot. He's a touchdown maker. He is a touch... down... maker. He is a threat to take it to the house every time he gets his hands on the ball. "Like I said, I think a lot of that is nonsense. I think it's someone who had this idea, and got into the analytics of it, and did all of these running backs and went through their whatever. Hey, Jonathan Stewart is in his 10th year, and he has hardly lost anything. "I don't believe in it. I don't care who you take. They can all get hurt. Nobody is immune." To begin, the idea that Stewart has hardly lost anything is comical. Stewart looked cooked last season, and his yards per carry have fallen in each of the last three years, most recently with a 3.4 yards per carry effort in 2017. Take Stewart’s rushes out of the equation and the Panthers averaged 4.9 yards per carry in 2017. He's as good an example of an aging running back losing his effectiveness as anyone. As you can see, only ONE of the NFL's projected starters at running back, Marshawn Lynch, is 30 years of age or older, and he has already retired once. The average age of the running backs above is 24.1 (!) years old. This isn't "analytics." It's more of an easily recognizable fact that running backs wear down far more quickly than players at other positions. Beyond that, finding a good running back isn't like finding a franchise quarterback, a quality offensive tackle, a good cover corner, or a stud edge rusher. Good running backs are easy to find. The other positions, not so much. And the importance of the position cannot be understated. Teams can be exposed when they don't have a QB, OT, CB, or lack a pass rush, whereas teams routinely have shown they can thrive without a top-flight running back. Barkley is a great prospect, and he could pay immediate dividends for a bad Giants offense. This in no way is an indictment on him. He has it all. He's fast, strong, he can catch, run inside, run outside, pass protect, and by all accounts he's a good kid. It's just an atrocious use of resources to take a running back with the No. 2 overall pick. If you're a Super Bowl contender looking for an immediate impact player for the short term, then sure, go draft yourself a running back talent in the middle-to-end of the first round. If you're not realistically going to compete for a Super Bowl anytime soon and you have a 37-year old quarterback who isn't good anymore, pass rushers who can't get to the quarterback, corners that can't cover, and a crappy offensive line, then maybe you should consider drafting a player at a position of far higher importance. ... WILL BE A DUMPSTER FIRE THIS SEASON. Gettleman's insistence on being an old-school team that pounds the rock on offense and plays good defense mirrors that of the Dallas Cowboys'. Because obviously, the team you want to emulate is the one in your division that has two playoff wins in the last 20 years. Anyway, while I think that building your team around a rushing attack is a path toward losing in today's NFL, at least the Cowboys already have personnel that fits that strategy. The Giants, on the other hand, have had one of the worst rushing attacks in the NFL. Over the last five years, the Giants have been unable to crack four yards per carry, which would be an extraordinarily meager accomplishment. That's awful. And yet, despite having intriguing weapons in the passing game like Odell Beckham Jr., Sterling Shepard, and Evan Engram, Gettleman stepped into this job and decided, nope, we're gonna run the ball, lol. OK, so we've already established that the Giants have made numerous moves that indicate that they want to build their offense around the run game, as the Panthers did when Gettleman was the GM in Carolina. Odell Beckham wants to be the highest paid player in the NFL, and not just the highest paid wide receiver. That's wholly unrealistic, but Beckham and his representation surely have a case for eclipsing Antonio Brown's $17 million/year contract, which currently stands as the most lucrative wide receiver contract in the league, even after missing most of last season with an ankle injury. Gettleman has a history of clashing and parting ways with talented, fan favorite players (Steve Smith, Josh Norman, and DeAngelo Williams, for example). Beckham is immensely talented, he knows it, he's scheduled to play in 2018 on a fifth year option exercised by the Giants at $8,459,000, and he just watched as fellow 2014 draft class receiver Sammy Watkins, a far less accomplished player after four years in the league, just got a $16 million/year contract in free agency. When faced with rumors about Beckham potentially being traded, Gettleman didn't exactly shoot it down. Beckham has had far more than his share of immature moments, even for a diva wide receiver. Beckham said he doesn't intend on holding out from training camp, and that's nice. Hooray for everybody! But if anyone thinks Beckham is going to quietly play on a crappy fifth year option this season, knowing full well that the team can also franchise tag him after the season – and continue to pay him far less than what he thinks he’s worth – then I would like to buy whatever delusional elixir it is that you're consuming. After an absolutely nightmarish season in which Ben McAdoo lost the locker room and looked about as inept as a head coach possibly could, it was only after McAdoo benched Manning that he lost his job. And frankly, Manning should have been benched (though it should have been Davis Webb playing, and not freaking Geno Smith, lol, but I digress). Anyway, the point here is that the Giants' loyalty to / belief in / ??? to Manning is odd. Yes, he was quarterback of a team with an amazing defensive line that won a pair of Super Bowls, and for that, he should have a special place in Giants history. 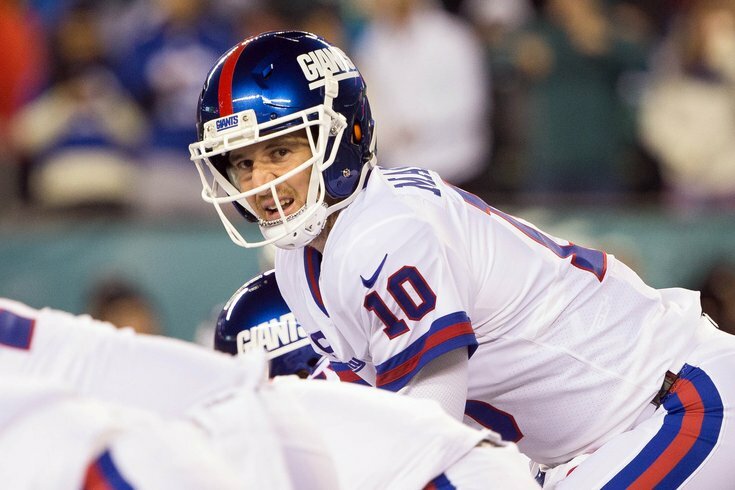 Coach Shurmur: We believe that Eli Manning has got years left as a starting quarterback in this league. Of course, Shurmur also helped convince the Vikings to trade a 1 and a 4 for Sam Bradford, so I guess his comments about Manning shouldn't come as a surprise. Oh yeah, we should probably mention the defense at some point, which stunk out loud last year. They couldn't stop the run, they couldn't stop the pass, they couldn't get after the quarterback, and they couldn't take the ball away. The combination of those four things is bad, right? The Giants' defense has been an oddity over the last three seasons. They were the 32nd (dead last) ranked defense in the league in 2015, then 10th in 2016, and then 31st (as you see above) in 2017. If you're a believer in "regression to the mean," then you probably believe that the Giants' defense will be improved in 2018. I wouldn't disagree. It's hard to get worse than "only better than Tampa." But I'll bring up "regression to mean" to go on a little tangent about the Giants as a team overall. In 2015, then went 6-10, losing a bunch of close games. They ended the season with a point differential of -22, which isn't good, obviously, but it's also not horrendous. They were better than their record would indicate, and therefore, it was reasonable to believe they would be better in 2016. And hey, they were! In 2016, the team went 11-5, a big improvement in record, but their point differential was more of a modest improvement, as they finished at +26. They weren't as good as their lofty record made it seemed, and they quietly lost in the wildcard round of the playoffs. Those two teams, one at 6-10, and one at 11-5, really weren't that different. However, the 3-13 Giants had a point differential of -142. It's not as if there were a slew of close games that derailed the season. They lost nine games by double-digit deficits. Will the team be better in 2018? The return of Beckham and the addition of Barkley will help, but those two guys aren't going to create a point differential swing of, say, 200 or so points with that defense playing anywhere near the way it did last year. As the chart above shows, the Giants had 27 sacks last season, which tied for 29th in the NFL. A guy with one hand (JPP) led the team with 8 of them, and the Giants then traded him to the Buccaneers for a third round pick, while incurring $15 million (!) in dead money in the process. The Giants' projected front seven starters (via Ourlads) in 2018 had 12 combined sacks last season. JPP, Vernon, and Harrison will count for a combined $41.6 million against the cap in 2018. Football Outsiders ranked the Giants dead last in special teams efficiency in 2017. So to recap, the Giants were bad on offense, defense, and special teams. I even heard a story that McAdoo was literally in a limo on his way to Philly from North Jersey to sign a deal, and after a phone conversation with Giants management, he had the limo turn around because the Giants had offered him whatever it was he was looking for. Oh if only McAdoo's phone had gone dead or something. Doug Pederson would have never been hired by the Eagles, and you Giants fans could still be reminding your Eagles fan buddy that his or her team doesn't have any Super Bowls. Bummer. What does this have to do with the hiring of Pat Shurmur? Nothing, lol. Just thought this was the appropriate time and place for that little anecdote to see the light of day. As for Shurmur, the Giants hired him, why, exactly? Because the Minnesota Vikings were halfway decent offensively for one season with a journeyman quarterback? Uh, ok. Apparently, one reasonably successful season makes up for a track record that has been less than awesome over Shurmur's career as a head coach and/or offensive coordinator. His average ranking in yards was 18.6. His average ranking in points was 18.3. In fairness, he didn't have a lot to work with talent-wise when he coached the Rams and Browns. On the other hand, he didn't really have much of a hand in Chip Kelly's offenses in Philly when they were racking up misleading, inflated offensive stats from 2013-2015. So maybe those two things even out. Anyway, that is not exactly a stellar résumé. Just don't bench King Eli, and you'll be fine, Pat.